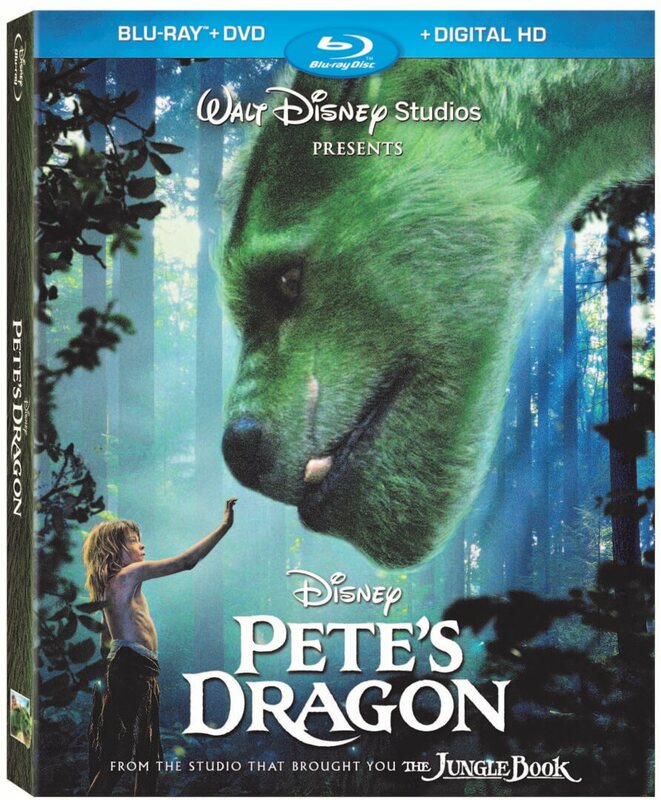 Given time to expand its wings and truly soar, Walt Disney Studios’ 2016 reimagining of Pete’s Dragon from director David Lowery can now be enjoyed anywhere with the new Blu-ray, DVD and Digital HD release starting today, November 29. As usual with Disney, the high-definition transfer looks fantastic and the 5.1 audio mix is expansive. Though its sweeping cinematography amid the gorgeous New Zealand scenery is practically necessary to capture all of Elliot (along with his mighty 80-foot-wide wingspan) and was particularly well suited for the cinema, it will still be quite effective regardless on a large screen — as will the intimacy of the more quiet and tender moments of the film. While the bonus features added up may not match some of the bigger releases from Walt Disney Studios in quantity, there’s still plenty to like among what is offered. None of the features last longer than 10 minutes, though the movie does come with an enjoyable and informative full-length audio commentary from Lowery, co-writer Toby Halbrooks and the child actors Oakes Fegley and Oona Laurence. There’s also a quick but funny blooper reel as well as an impressive-looking Welcome To New Zealand featurette that will make you want to hop on a plane instantly to visit the beautiful country for fun (or to shoot your own blockbuster movie). Making Magic is a cute segment (that could have been a bit longer) in which we’re treated to some fun facts about Elliot along with some before-and-after special effects shots. Two music videos are also included featuring tunes that helped create the timeless feel of the film. Surprisingly for a big budget movie from one of the largest studios in the world, Lowery proudly points out how no one else touched the script he wrote with Halbrooks. That was just one of the more interesting tidbits in the excellent Notes to Self: A Director’s Diary feature in which Lowery narrates a few key selections from his personal journey as he prepares to shoot the movie — all the way through the production wrapping up months later. The unique insight and observations he makes throughout the making of the film made this a particularly insightful featurette for those interested in the craft of moviemaking. Lowery also makes an appearance at the beginning of “Disappearing” Moments to share a selection of deleted scenes and shots that didn’t make it into the final cut but instead are loosely pieced together into a montage. A few scenes help to explain some of the finer points of the story while others made sense to leave on the cutting floor, and without having to individually choose each scene to watch as you normally would, you can just sit back and take it all in more efficiently. If you and your family loved the movie after seeing it in the theaters, then you’ll definitely want to own it so everyone can enjoy it again and again. Those who haven’t seen it yet won’t be disappointed, and it also makes a great stocking stuffer for the Disney fan on your shopping list. For more on the film, make sure to read our recent exclusive interview with director David Lowery where we discuss some of the creative choices he made for this remake of the Disney classic as well as an update on his live-action “Peter Pan” movie that he’s developing for Disney with co-writer Toby Halbrooks. “Pete’s Dragon” is now available on Digital HD, Blu-ray, Disney Movies Anywhere, DVD and On-Demand. Walt Disney World launches Highway in the Sky Dine-Around on December 2nd! Older Older post: Walt Disney World launches Highway in the Sky Dine-Around on December 2nd!